Howdy, friends! Today we are celebrating! And when there’s a celebration, there are always brigadeiros involved! 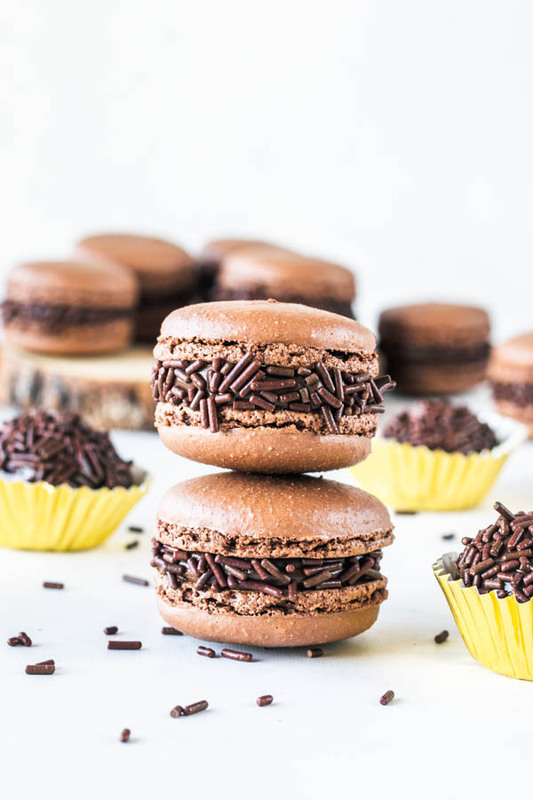 Brigadeiro Macarons are inspired on the Brazilian birthday party treat called brigadeiro, extremely popular and present at every single birthday party ever. If you have never had brigadeiro, I advise you to make this, because it will be worth it. Making brigadeiros isn’t really hard. It’s a walk in the park. Just bring condensed milk, chocolate, and butter to a boil, and keep stirring through a low simmer for about 15 minutes. What’s really hard, they say, is to make the macaron shells. Is it really that hard to make macarons? Once you get the hang of it, everything will be alright. You just have to find the right method that works for you. 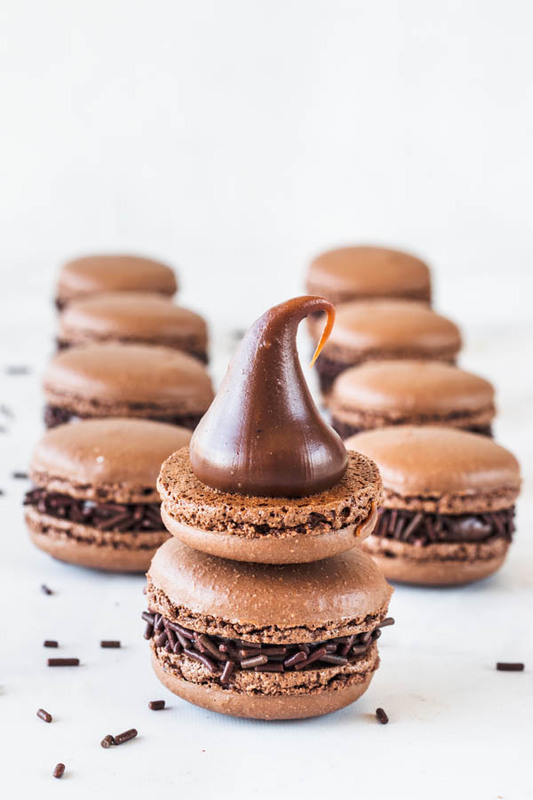 There are 3 different ways to make macarons: French method, Swiss, or Italian. I use the Swiss style in my recipes. After experimenting with all methods over the years, I’ve settled with my Swiss. I know people who prefer the Italian, and some that swear by the French method. There’s no right or wrong when it comes to stuff like that. For example, some people believe you should let your egg whites age, so they will be “drier”, and more optimal for the meringue. 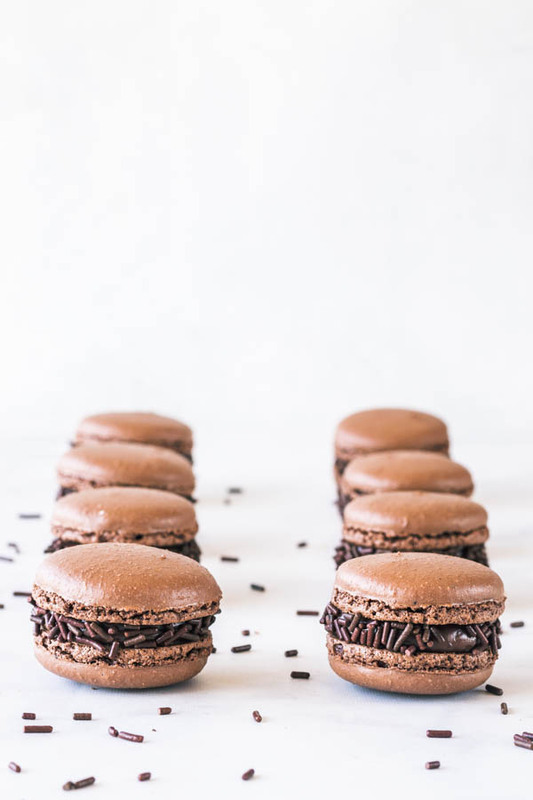 Others swear by sifting the powdered sugar and almond flour a bunch of times before making your macarons. As for me, I don’t do either of those things. I don’t let my whites age, but I do use room temperature whites. I’ve let my whites dry in the past, but I haven’t noticed any differences. Perhaps I should experiment again. I only sift my flour and powdered sugar once. But I don’t doubt that those steps might help other people, or be perfectly incorporated into their preferred macaron baking method. 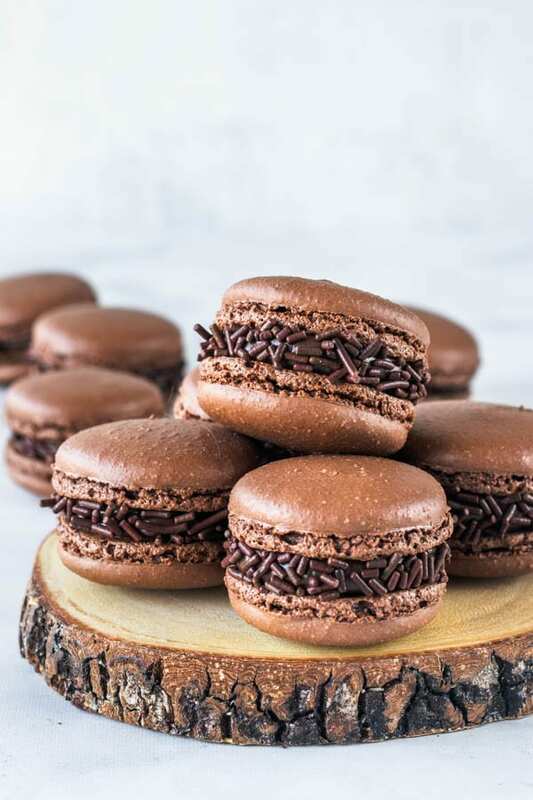 To nail making macarons is a matter of finding out what the batter is supposed to look and feel like, above anything else. Once you know with confidence when to stop folding, you have mastered macarons. Which is not to say that you will get them perfect every single time. Sometimes you have an off day, or you get distracted and overfold the batter. 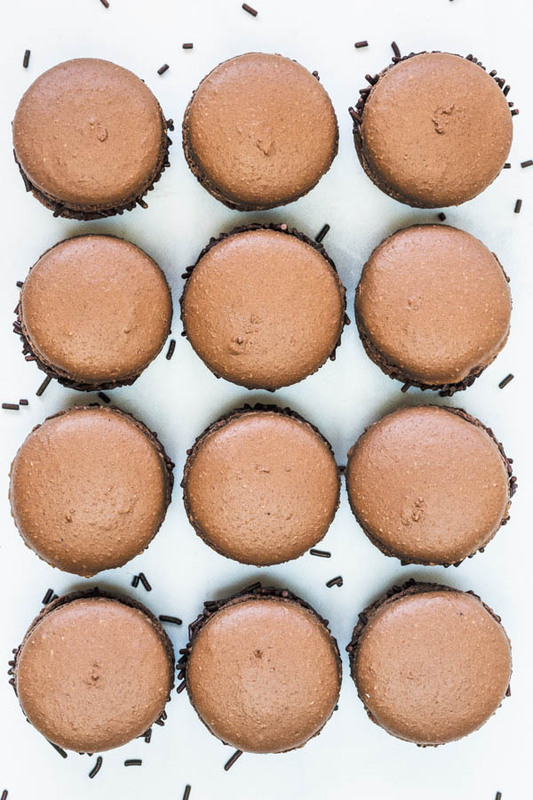 So get your head in the game and let’s make some macarons. I have pretty detailed instructions down below. 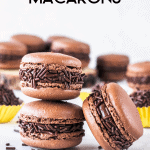 And now, I am working on a Macaron E-book. A project that I’ve been designing and thinking about for a while, and I started writing, baking, and shooting for it. 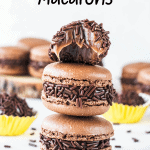 So be on the lookout for my Macaron E-book, sometime soon! 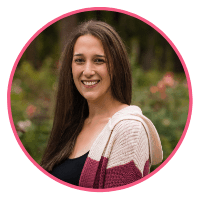 For now, I have some resources you can check out. And also, if you like the idea of this Brazilian treat called brigadeiro, I have a few more recipes that involve this fudgy treat absolutely impossible to resist. For example, on my Death by Brigadeiro Cupcakes, Almond Cupcakes, Macadamia Coconut Cupcakes, in the filling of my Chocolate Strawberry Cake, and Chocolate Strawberry Cupcakes. So brigadeiros are present at every single birthday party or celebration in Brazil. And brigadeiros are so versatile, you can make them infinite different flavors. The chocolate one is probably the most popular one, along with the coconut. They are all my favorite and I could literally eat the whole thing with a spoon. 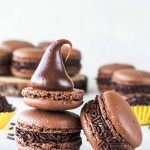 If you have made my chocolate macaron shells before (like in my Dulce de Leche Macarons, and Espresso Peanut Butter Chocolate Macarons) I have an update to the recipe. I’ve toned down the amount of cocoa powder in the recipe by half of a tablespoon. It didn’t make a huge difference, but made the macarons a bit less dense. I hope you liked today’s recipe. 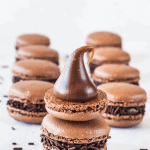 If you are looking to master macarons, I have a tone of macaron recipes on my website. 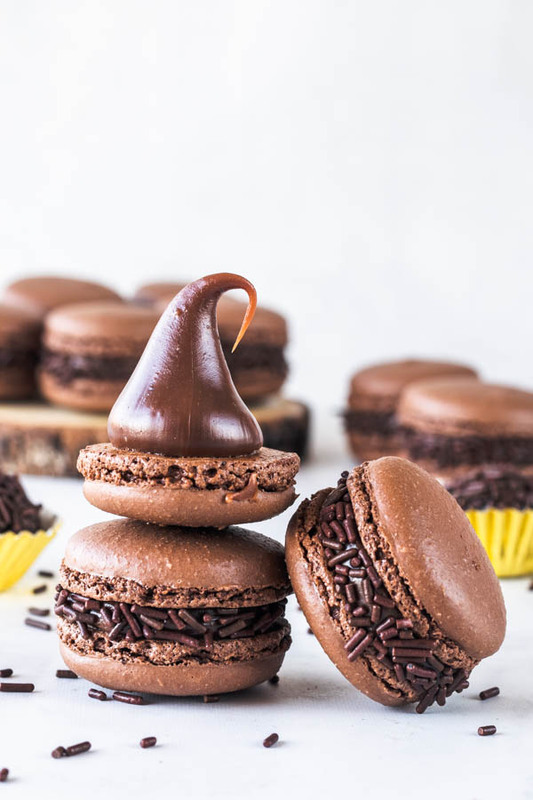 Just click here to check out some more macaron recipes. 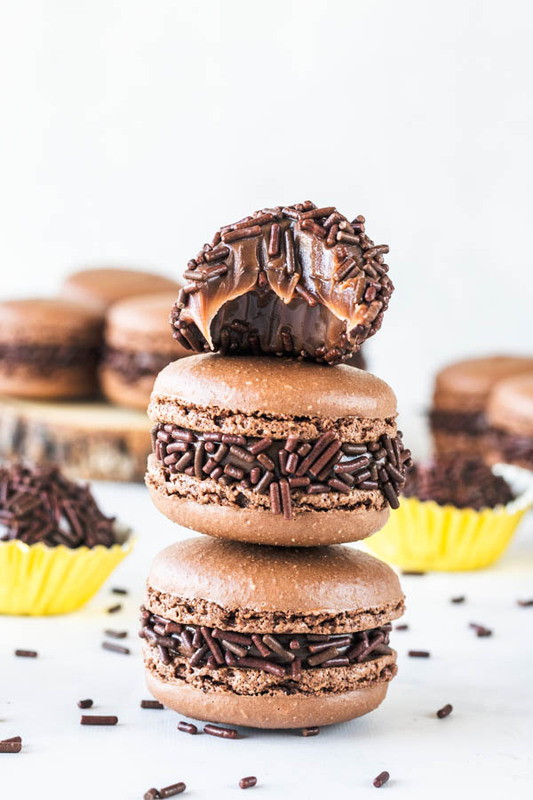 These Brigadeiro Macarons have a chocolate macaron shell, and a fudgy chocolatey brigadeiro filling. Place condensed milk, chopped chocolate of preference, and butter in a medium saucepan. Over medium-high heat, cook the mixture, constantly stirring. Seriously, don’t stop stirring. You are going to cook this mixture for approximately 15-20 minutes. 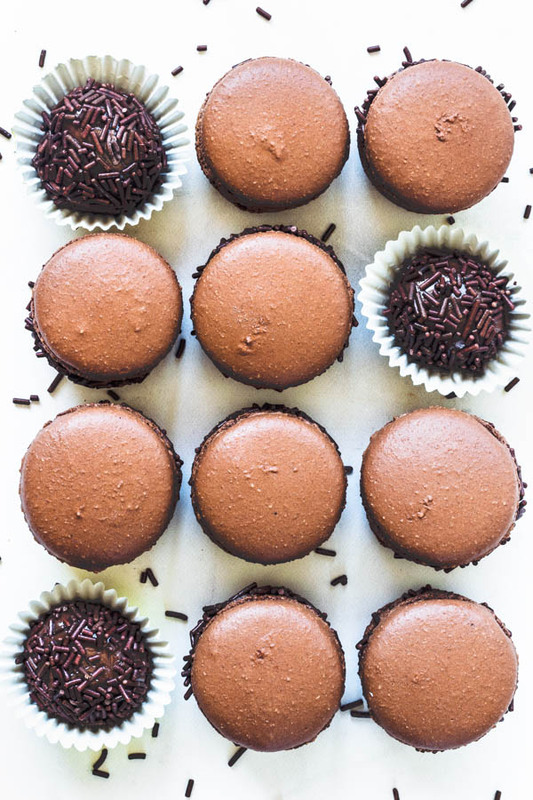 Depending on what you’re using your brigadeiro for, you might want it to be softer or firmer. Since we are using it to make fudge balls, and then to frost the cupcakes, we want the consistency to be on the firm side. You will know that the brigadeiro is ready to go when you tilt the pan over and all of the brigadeiro comes out from the bottom of the pan easily. Remove brigadeiro to a heat proof bowl. Let it cool down. You want to pipe the brigadeiro when it’s a room temperature. 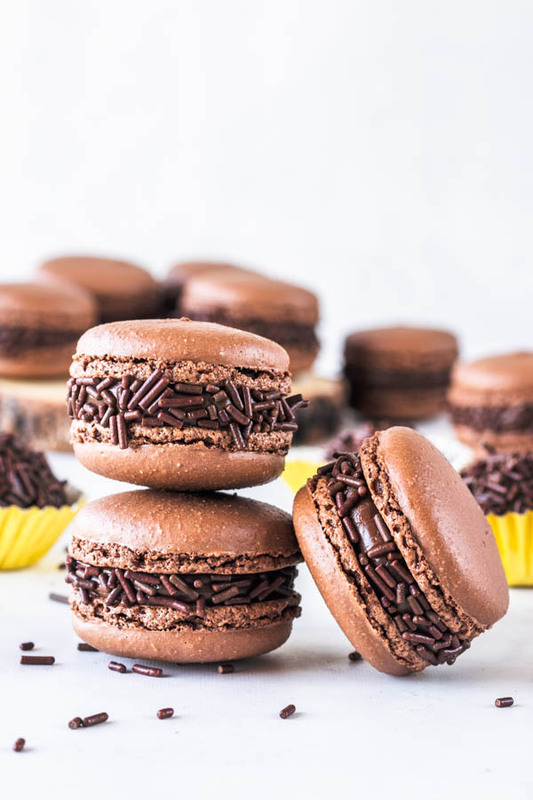 If you place the brigadeiro in the fridge to continue with the filling later, just make sure you bring it back to room temperature for a couple of hours before using it to pipe the filling on the macaron shells. Place brigadeiro in a piping bag and pipe on top of half of the macarons. Top with another macaron. Esses doces são covardia, muito gostosos!!!! !